Scientific curiosity has been a driving force behind the research of retired IBM scientist Dr. Dieter W. Pohl. It drove him to put the famous Abbé diffraction limit in question. His 1982 invention, the “scanning near-field optical microscope” or SNOM (European Patent EP0112401, US Patent US 4604520) provided a groundbreaking technique for optical investigations in the nanometer regime, i.e. beyond the diffraction limit. “Actually I dreamed of becoming an architect as a child. However, my skill of drawing was poor. So I decided it better to go into physics,” Dieter said, “and I never did regret it”. Dieter’s invention thus was a forerunner to the various methods of “breaking the diffraction limit” known today. Two of them, based on complementary research on single molecule fluorescence, achieved this year’s Nobel prize in chemistry, awarded today in Stockholm to E. Betzig, W.E. Moerner, and S. Hell. Dieter earned his doctoral degree at the Technical University Munich in 1968. 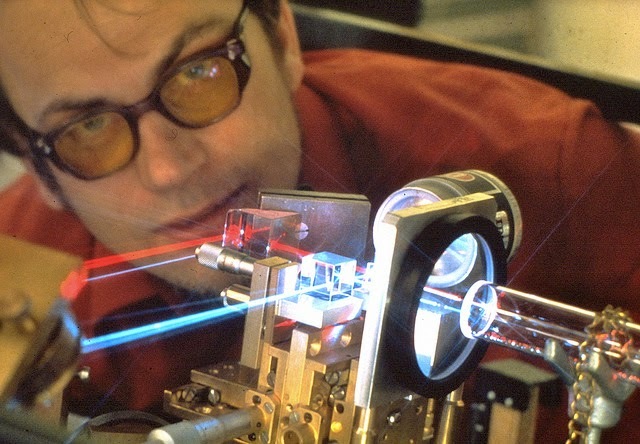 He pursued his field of research, lasers, at IBM’s first international laboratory in Switzerland. It had been officially opened only five years before in Rueschlikon and had selected laser optics as one of its core themes. Some 10 years later, it was to become the birthplace of two of the highest resolution microscopes, scanning tunneling microscope (STM), and shortly later, SNOM in optics. After a couple of years in Switzerland, he had the chance to go to the IBM T.J Watson Research Center in Yorktown Heights, NY for an assignment — a time which would play an important role throughout his career. Back in Switzerland in 1980, Dieter met a young, promising physicist, future Nobel Laureate Gerd Binnig. Gerd had just invented the scanning tunneling microscope with his colleagues Heinrich Rohrer and Christoph Gerber. At that time optical microscopy was characterized by a presumed limitation: that it would never obtain a better resolution than half the wavelength of light. Helped by a small hole, however, Dieter and his team cleverly circumvented this limitation. This breakthrough discovery took place in 1982. Essential was that they had placed the hole at the apex of a transparent, metal-coated tip. As any good IBM inventor, Dieter filed the patent mentioned before, followed by an Applied Physics Letter. Delighted to present his findings at an optical instruments conference in 1985, the response turned out to be nothing what he expected. “I was so proud to present these results. There were many high ranking old men in the audience. They all said ‘no, this can’t be possible.’ And I watched as they turned away, mumbling to their neighbors in utter disbelief,” said Dieter. In the early 1990s near-field optics’ interest had risen to a sizeable number of scientists in various countries; it was time for a meeting which Dieter and Daniel Courjon (from France) organized. Some 50 people participated, among them 2014 Nobel Prize winner Eric Betzig. Because, during Eric’s absence from science, emphasis in NFO changed from mere microscopy to a broader way of looking at near field optics. With the strongly enhanced light spot in the gap of an efficient antenna, instead of the weak one at the tiny aperture, a plethora of novel experiments and potential applications became feasible. After 31 years of service Dieter retired from IBM in 1999. He was granted permission to take his experiments with him to the University of Basel. At present, he has a collaboration with the Photonics Laboratory of the ETH in Zurich.